Greetings travelers. To the east of Angkor Thom towards Lake Dawn and very close to the southern shore there is somewhere to eat that is fine. At this restaurant you can eat in the shade while sitting at table. It seems silly but really after a long hot day touring temples being in a place where you can relax a little is much appreciated. This restaurant is in an open shed, sheltered by vegetation. 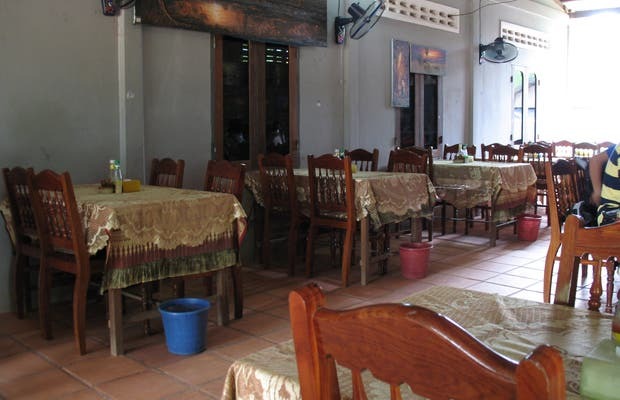 If offers typical Cambodian food but you can even find a dish that is essentially Western. In this place we had the opportunity to try dishes such as duck with honey. Cambodian cuisine offers distinctive flavors and is based on fish, meat, soup, and lots of vegetables and fruits.